Since its foundation nearly two hundred years ago the Shakespeare Club has been so bound up with the development of Stratford-upon-Avon that this book can be seen as alternative history of the town. It tells how the people of Stratford asserted their pride in Shakespeare as a local poet by celebrating his life and work in their own way while the town transformed itself into the world centre of Shakespeare performance and celebration. The oldest Shakespeare organisation in the world, the Club has been called “Shakespeare’s ultimate fan club”, and this beautifully-illustrated book, written by two long-term members of its committee, tells its full story for the first time. Susan Brock and Sylvia Morris. 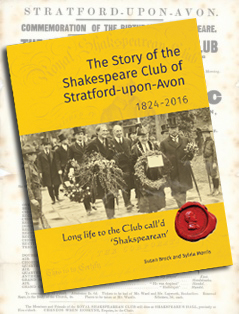 The Story of the Shakespeare Club of Stratford-upon-Avon 1824-2016: Long life to the Club call’d ‘Shakspearean’. Published by the Shakespeare Club of Stratford-upon-Avon, 2016. The book is available direct from Dr Susan Brock and payment can be made by cheque or BACS transfer. Please send an email to stratfordshakespeareclub@gmail.com including your name and address and an invoice will be supplied. UK postage and packing is £3. The book is also available from the Shakespeare Birthplace Trust bookshop and the Stratford branch of Waterstones.